South Africans are allowing Zuma a chance to prove himself -- will the wider world? JOHANNESBURG, South Africa (CNN) -- There is a quiet if somewhat skeptical reappraisal taking place in the middle-class suburbs of South Africa. More and more people are expressing their support for newly-elected President Jacob Zuma. ANC leader Jacob Zuma has promised to govern in the same manner as Nelson Mandela. It's an important development because it was many in the middle-class, regardless of race, who were most opposed to Zuma becoming president of South Africa. His inaugural speech, delivered last weekend, was masterly, promising to return South African society to the values of the Mandela era. That alone has done much to win him the respect of his former detractors. The choices he has made in his new cabinet have increased that respect. He has retained the skills of people like Barbara Hogan, former health minister, though she has been moved to a less prominent job. Do you think Jacob Zuma can deliver on his promises? Former finance minister Trevor Manuel becomes head of a new planning commission with wide powers; he has attracted Pravin Gordhan, who proved highly capable as head of the country's tax authority, to the finance post. And Zuma has appointed ANC stalwart and multi-millionaire businessman Tokyo Sexwale to the post of human settlement minister. These appointments will help to reassure the business community that there will be no precipitous lurch to the Left under Zuma's watch. The appointment of Pieter Mulder as deputy minister of agriculture is a savvy olive branch to the Afrikaner right, while the new president has also paid his dues to his leftist allies by appointing the leader of the Communist party Blade Nzimande to take charge of higher education. In his first days in office, Zuma has displayed consummate leadership. He came into office with the near-adoring approval of two out of three South African voters -- the vast majority of whom were drawn from the swelling ranks of the country's black poor. His greatest challenge is to help these people, to confront South Africa's miserable legacy of poverty and the brutal crime that plagues all walks of society. But if he is to deliver the better life he has promised his supporters and begin to bring down crime levels, then he knows that he desperately needs the middle-class. They are the people who pay the bulk of the taxes he needs to fund even the most rudimentary social services that are under such strain in South Africa. He needs them to build businesses which employ his poor supporters; he needs them to invest in the country; and, crucially, he needs them to persuade overseas skeptics that they, in turn, should keep investing in South Africa. 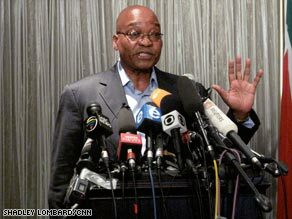 Zuma has, indisputably, displayed poor judgment in the past. Charges of fraud and corruption against him have been dropped, but some opponents say that doubts remain as to his probity, no matter how much those doubts infuriate him and his supporters. He and his cabinet may chafe at perceptions abroad that South Africa is heading the way of so many other African countries. But the tension and political and legal uncertainty in the last years surrounding his rise to power have led many foreign observers to conclude that the country will be on the road to decline under his leadership. This is not the view of most South Africans, black or white. From his compatriots Zuma has earned the chance to prove himself, but his next challenge will be to earn the same respect in the wider world. His handling of the ongoing crisis in Zimbabwe will likely be a crucial test in the coming months. He is caught in a dilemma. The political reality is that he cannot, as an African leader, institute the hard line against Robert Mugabe demanded by the West. On the other hand, he cannot follow the drifting, vague notions of African solidarity pursued by his predecessor, Thabo Mbeki. The world will be watching closely to see what he does.